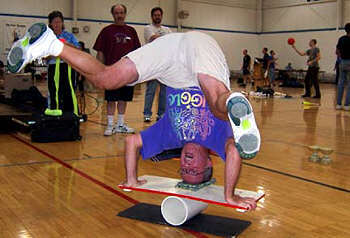 shooting a basketball from a headstand. This 30 second video is just a stupid human trick (contains no audio). I saw this trick and fell in love with it. With the typical juggler's response of "I can do that!" I set to work. I have been able to do a headstand since I was a little kid - so how tough can it be? Fairly difficult, it turns out. The toughest part is lifting the ball up into the air as it is murder on your abdominals. Well, maybe the tougher part is seeing someone shooting baskets and not saying "I can do that well standing on my head." Doing this trick has given me rock hard abdominals - but I have such concern for other people's feelings that I keep them covered . . . with a nice layer of flab. I was practicing at our local YMCA. Two young girls (maybe 7 years old) who were obviously not basketball players decided to shoot some baskets. The only thing they hit with any consistency was the floor. They tried all 6 goals in the gym with identical results. I set up to shoot my basketball shot, they stop to watch - I make it. They walk the length of the gym (without even dribbling the balls) and put the balls away. The end (for now) of the stupid tricks. Even while standing on his head and in pain - Terry is still talking. Fillet an ink pen with a cylindrical barrel. Place the empty barrel on a table about a foot from the edge. Put your finger on the center of the pen and press down firmly. Roll the pen backwards until it squirts out from under you finger. The pen should have tremendous back spin and will rise a foot or more and fly for several feet. Launching towards a heat register or other updraft will enhance the effect.